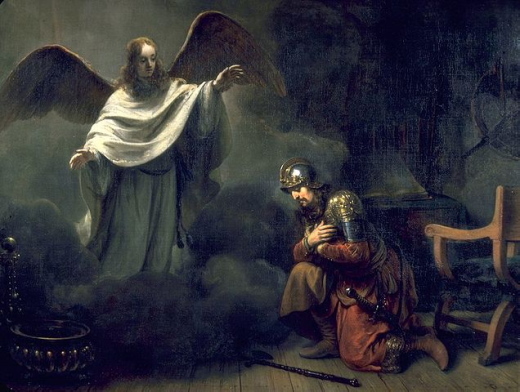 In this painting by Gerbrand van den Eeckhout an angel appears to the Roman centurion Cornelius. The angel tells him to seek out St. Peter. But as for you, come here, you children of a sorceress, you offspring of an adulterer and a whore. Whom are you mocking? Against whom do you open your mouth wide and stick out your tongue? Are you not children of transgression, the offspring of deceit-- you that burn with lust among the oaks, under every green tree; you that slaughter your children in the valleys, under the clefts of the rocks? Among the smooth stones of the valley is your portion; they, they, are your lot; to them you have poured out a drink offering, you have brought a grain offering. Shall I be appeased for these things? Upon a high and lofty mountain you have set your bed, and there you went up to offer sacrifice. Behind the door and the doorpost you have set up your symbol; for, in deserting me, you have uncovered your bed, you have gone up to it, you have made it wide; and you have made a bargain for yourself with them, you have loved their bed, you have gazed on their nakedness. You journeyed to Molech with oil, and multiplied your perfumes; you sent your envoys far away, and sent down even to Sheol. You grew weary from your many wanderings, but you did not say, "It is useless." You found your desire rekindled, and so you did not weaken. Whom did you dread and fear so that you lied, and did not remember me or give me a thought? Have I not kept silent and closed my eyes, and so you do not fear me? I will concede your righteousness and your works, but they will not help you. When you cry out, let your collection of idols deliver you! The wind will carry them off, a breath will take them away. But whoever takes refuge in me shall possess the land and inherit my holy mountain. If we live by the Spirit, let us also be guided by the Spirit. Let us not become conceited, competing against one another, envying one another. My friends, if anyone is detected in a transgression, you who have received the Spirit should restore such a one in a spirit of gentleness. Take care that you yourselves are not tempted. Bear one another's burdens, and in this way you will fulfill the law of Christ. For if those who are nothing think they are something, they deceive themselves. All must test their own work; then that work, rather than their neighbor's work, will become a cause for pride. For all must carry their own loads. Those who are taught the word must share in all good things with their teacher. Do not be deceived; God is not mocked, for you reap whatever you sow. If you sow to your own flesh, you will reap corruption from the flesh; but if you sow to the Spirit, you will reap eternal life from the Spirit. So let us not grow weary in doing what is right, for we will reap at harvest time, if we do not give up. So then, whenever we have an opportunity, let us work for the good of all, and especially for those of the family of faith. When they came to the disciples, they saw a great crowd around them, and some scribes arguing with them. When the whole crowd saw him, they were immediately overcome with awe, and they ran forward to greet him. He asked them, "What are you arguing about with them?" 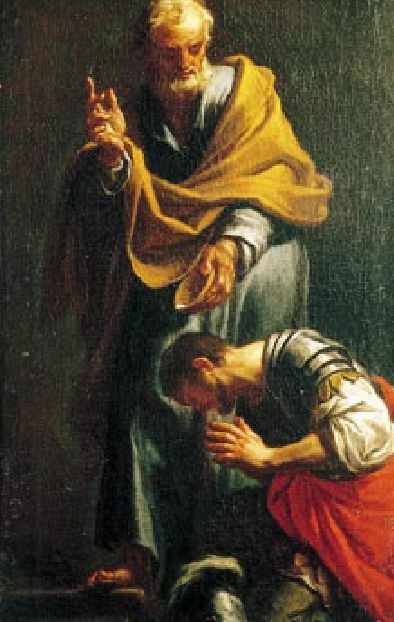 Someone from the crowd answered him, "Teacher, I brought you my son; he has a spirit that makes him unable to speak; and whenever it seizes him, it dashes him down; and he foams and grinds his teeth and becomes rigid; and I asked your disciples to cast it out, but they could not do so." He answered them, "You faithless generation, how much longer must I be among you? How much longer must I put up with you? Bring him to me." And they brought the boy to him. When the spirit saw him, immediately it convulsed the boy, and he fell on the ground and rolled about, foaming at the mouth. Jesus asked the father, "How long has this been happening to him?" And he said, "From childhood. It has often cast him into the fire and into the water, to destroy him; but if you are able to do anything, have pity on us and help us." Jesus said to him, "If you are able!-- All things can be done for the one who believes." Immediately the father of the child cried out, "I believe; help my unbelief!" When Jesus saw that a crowd came running together, he rebuked the unclean spirit, saying to it, "You spirit that keeps this boy from speaking and hearing, I command you, come out of him, and never enter him again!" After crying out and convulsing him terribly, it came out, and the boy was like a corpse, so that most of them said, "He is dead." But Jesus took him by the hand and lifted him up, and he was able to stand. When he had entered the house, his disciples asked him privately, "Why could we not cast it out?" He said to them, "This kind can come out only through prayer." Our Lord, of course, was Jewish. Some felt that the Christ had come to the Jews alone and that one must first become a Jew in order to become a Christian. Cornelius was a Gentile and a centurion (an officer in the Roman Army) stationed at Caesarea. He was widely respected among the Jews, not only because of his important position but also because he gave liberally to the poor and "honored God as they did." He was called "upright and God-fearing." 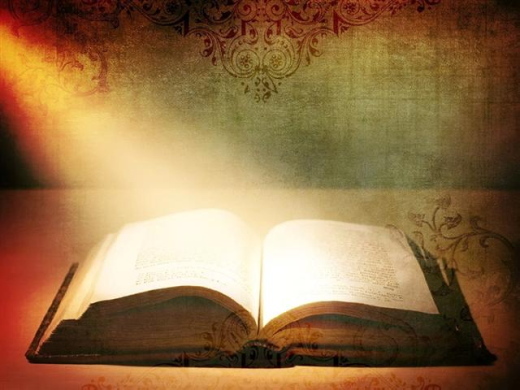 He learned of Jesus Christ from the Apostle Peter, received the Holy Spirit, and was baptized. 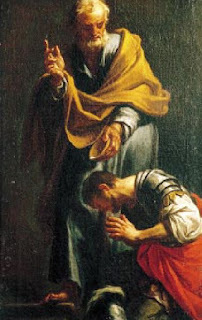 It was Cornelius' profession of faith that led Peter to exclaim, "God has shown me that I should not call any man common or unclean"God shows no partiality, but in every nation anyone who fears him and does what is right is acceptable to him." Perhaps the testimony of Cornelius would be helpful to those in our own time who see Christianity as a purely cultural thing. He is a fitting patron for the career soldier. Psalm 18:1-2 (NIV) [ Psalm 18 ] [ For the director of music. Of David the servant of the Lord. He sang to the Lord the words of this song when the Lord delivered him from the hand of all his enemies and from the hand of Saul. He said: ] I love you, Lord, my strength. 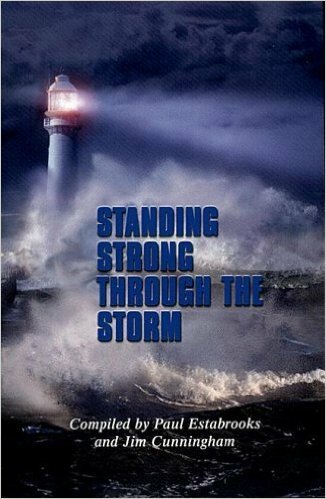 The Lord is my rock, my fortress and my deliverer; my God is my rock, in whom I take refuge, my shield and the horn of my salvation, my stronghold. Morning Devotions with Cap'n Kenny - "Our Forever Legacy"
When David was on his deathbed, he called in his son Solomon. Solomon was going to carry on his reign as king, and here is what David said to him, "As for you, my son Solomon, know the God of your father, and serve Him with a loyal heart and with a willing mind; for the Lord searches all hearts and understands all the intent of the thoughts. 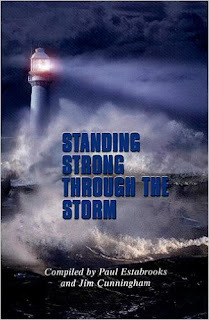 If you seek Him, He will be found by you; but if you forsake Him, He will cast you off forever" (1 Chronicles 28:9). Like David, we are all leaving a legacy. And our job as parents is to bring our children to Christ, by our actions and by our words. The legacy we leave for those that follow will affect generations to come. James Merritt, in his book What God Wants Every Dad to Know, wrote, "Fatherhood is more than conceiving, feeding, clothing, educating, and sending children out on their own. Dads have the responsibility of preparing their children for their eternal destiny of meeting God." I agree with that. We are passing on an eternal legacy. Listen to this: the choices of our time are binding in eternity—not just during life here on earth, but forever. Having lived over 60 years on this earth, I have seen many generations. My grandparents' generation. My parents' generation. My generation. My children's generation. My grandchildren's generation. And here is what I have seen: things we do today impact us later in life. Our actions impact our children and our grandchildren and our great-grandchildren. You are leaving a legacy. The question is: is it a godly legacy or an ungodly legacy? What lessons from our parents are healthy for our relationship? What bad relationship habits did we learn from them? How should we do things differently? Where do we learn wisdom that transcends parental teachings? How will we model wisdom for our children? What are some good things they will learn about marriage from us? 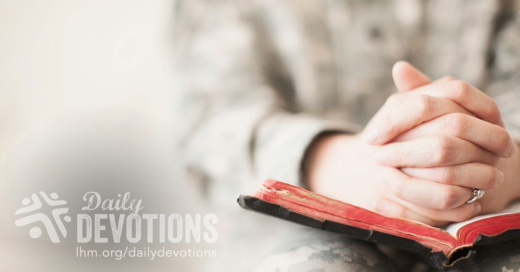 LHM Daily Devotion - "Remembered, Loved, and Wanted"
That probably is a good description of Lawrence Keys. It was not always that way. Once Uncle Sam had wanted Keys. For 20 months, from 1956-1957, he served his country as a private-first class. But that was a long time ago. On November 16th, at the age of 78, Lawrence Keys' heart gave out and he died at Christus St. Vincent Hospital in Santa Fe, New Mexico. I would love to tell you a loving family was by his side during his last moments. But he had no family other than a distant cousin who had never heard of him. If it were true, I would be glad to tell you his last days were spent bidding farewell to a never-ending line of old friends and pals. Sadly, there were never any guests waiting to see Lawrence Keys. After Lawrence Keys died his body was taken to the hospital morgue where it waited for someone to claim him. That first day nobody came. The first week, nobody showed. An entire month passed and the shell, which once had been Private First-Class Lawrence Keys, was still in the morgue: unremembered, unloved, and unwanted. 1. They accepted his body. 2. Then they offered $6,000 so that Lawrence Keys might receive a full military funeral and burial at Santa Fe National Cemetery. 3. They extended invitations to firefighters, police officers, and veterans' support groups, asking them to attend the farewell for Keys. The response to those invitations has been positive and even a general from the Army National Guard had promised to show up. It appears, because of some caring individuals, at the very end Lawrence Keys was no longer unremembered, unloved, and unwanted. I hope you remember the story of Lawrence Keys, because it might have been your story. You see there was a time when you, because of your many sins, might also have been unremembered, unloved, and unwanted. That might have been the case for all of us if the Triune God were not a gracious and merciful Divinity. You see, in spite of our sins, the Lord continued to love us. Rather than seeing us be forgotten forever in the flames and fire of hell, He sent His Son into this world to save us. From birth to death, Jesus showed us that we were remembered, loved, and wanted. The Redeemer's life and death leading to His glorious resurrection tell us that this is so. THE PRAYER: Dear Lord, we cannot imagine the depth of Your love that reached out to us while we were sinners. May we give thanks for the Savior's sacrifice and lead lives that show we have not forgotten You. In Jesus' Name. Amen. Our Christian neighbor often asks, “Is this also something to thank God for?” She is referring to 1 Thessalonians 5:18: “Give thanks in all circumstances, for this is God's will for you in Christ Jesus.” We always say, “Yes, of course, we thank God in all things.” But the half-hearted manner in which we say it is contradicted by our grumbling every time the power goes off. Father, we honor You with our words, but so often our actions reveal that our hearts don’t trust You. Help us to see You at work in every circumstance, no matter how difficult. By God’s grace we can be thankful in all things. Sống ở vùng ngoại ô, chúng tôi hay than phiền về tình trạng mất điện thường xuyên. Có khi một tuần mất điện ba lần và mỗi lần kéo dài có lúc đến 24 tiếng, kéo cả khu dân cư chìm trong bóng tối. Điều này đặc biệt khó chịu khi chúng tôi không thể sử dụng những thiết bị điện gia dụng cơ bản. Một người tín đồ hàng xóm của tôi thường hỏi: “Đây có phải là điều chúng ta cũng cần cảm tạ Chúa không?” Cô ấy liên tưởng đến 1 Tê-sa-lô-ni-ca 5:18: “Hãy cảm tạ Chúa trong mọi hoàn cảnh, vì đó là ý muốn của Đức Chúa Trời đối với anh em trong Đấng Christ Jêsus.” Chúng tôi luôn nói: “Dĩ nhiên là cần! Chúng ta cảm tạ Chúa trong mọi điều.” Nhưng cách nói miễn cưỡng mâu thuẫn với sự cằn nhằn của chúng tôi mỗi khi bị cúp điện. Một chiếc xe rác đã đâm vào cây cột điện ngay trước cửa nhà cô, kéo dây điện cao thế xuống ngay trước mấy căn nhà. Nếu lúc đó có điện thì thương vong là điều không thể tránh khỏi. Khó khăn chúng ta gặp phải có thể làm chúng ta thấy khó nói: “Con cảm ơn Chúa!” Chúng ta có thể cảm tạ Chúa, Đấng nhìn thấy cơ hội trong mọi hoàn cảnh để chúng ta tin cậy Ngài – dù chúng ta có thấy được mục đích của Ngài hay không. Cha ôi, chúng con thường tôn kính Ngài bằng lời nói, nhưng hành động của chúng con lại cho thấy lòng chúng con không tin cậy Ngài. Xin giúp chúng con nhìn thấy Ngài hành động trong mọi hoàn cảnh, dẫu khó khăn đến đâu. Nhờ ân điển của Chúa, chúng ta có thể cảm tạ Ngài trong mọi sự. Dad gracias en todo, porque esta es la voluntad de Dios para con vosotros en Cristo Jesús (1 Tesalonicenses 5:18). Señor, ayúdame a verte en cada circunstancia. Por la gracia de Dios, podemos dar gracias en todo. In unserem Stadtteil fällt häufig der Strom aus und alles versinkt in Finsternis. Das kann bis zu dreimal in der Woche vorkommen und vierundzwanzig Stunden dauern. Besonders lästig ist, dass wir nicht einmal die Haushaltsgeräte benutzen können. Unsere Nachbarin fragt oft: „Müssen wir Gott dafür dankbar sein?“ Sie bezieht sich auf 1.Thessalonicher 5,18: „Seid dankbar in allen Dingen, denn das ist der Wille Gottes in Christus Jesus an euch.“ Wir sagen dann immer: „Selbstverständlich, wir danken Gott in allen Dingen.“ Aber die halbherzige Antwort steht in krassem Widerspruch zu unserem regelmäßigen Jammern, wenn wieder einmal der Strom ausfällt. Ein Müllauto war mit dem Strompfosten vor ihrem Haus kollidiert und die Hochspannungsleitungen waren direkt auf ein paar Häuser gefallen. Hätten die Kabel unter Strom gestanden, hätte es bestimmt Todesopfer gegeben. In Schwierigkeiten fällt es uns manchmal schwer zu sagen: „Danke, Herr.“ Dennoch können wir unserem Gott dankbar sein, der uns in jeder Situation Gelegenheit gibt, ihm zu vertrauen—ob wir seine Ziele darin erkennen oder nicht. Vater, wir ehren dich mit unseren Worten, aber unser Handeln zeigt oft, dass wir dir nicht mit dem Herzen vertrauen. Hilf uns, dein Wirken in allen Umständen zu sehen, auch in den schweren. Mit Gottes Gnade können wir in allen Dingen dankbar sein. Dans le quartier, nous critiquons les pannes d’électricité incessantes. Elles peuvent se produire jusqu’à trois fois par semaine et durer jusqu’à vingt‑quatre heures. L’impossibilité d’utiliser les appareils ménagers rend les choses pénibles. Notre voisine chrétienne nous demande souvent : « S’agit‑il d’une chose dont nous devrions aussi remercier Dieu ? », en faisant allusion au verset : « Rendez grâces en toutes choses, car c’est à votre égard la volonté de Dieu en Jésus‑Christ. » (1 TH 5.18). À cela, nous lui répondons toujours : « Oui, bien sûr, nous lui rendons grâces en toutes choses. » Reste que notre peu de sincérité trahit le fait que nous maugréons lors de chaque panne. Un camion d’éboueurs avait percuté un poteau d’électricité devant chez elle, faisant tomber les câbles à haute tension sur plusieurs maisons. 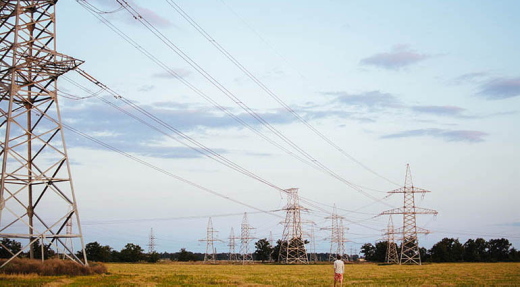 Si l’électricité y avait circulé ce jour‑là, des gens auraient pu mourir. Toute situation pénible risque de nous donner du mal à en remercier Dieu. Nous pouvons néanmoins lui exprimer notre gratitude du fait qu’il voit en toute situation l’occasion de lui faire confiance. Par la grâce de Dieu, nous pouvons lui rendre grâces en toutes choses. Через постійні відключення електроенергії наш район часто занурюється у темряву. Дуже важко терпіти таку незручність, коли неможливо користуватись дома найважливішими приладами. Наша віруюча сусідка часто запитувала в нас: “А за це теж потрібно дякувати Богу”. Вона мала на увазі відомий вірш: “Подяку складайте за все, бо така Божа воля про вас у Христі Ісусі” (1 Сол. 5:18). І ми завжди відповідали: “Так, звісно. Треба дякувати Богу за все”. Але ми казали це без особливого ентузіазму, і наші слова суперечили нашим постійним ремствуванням, коли гасло світло. Але одного дня наша віра в те, що “треба дякувати Богу за все”, набула нового значення. Коли я повернувся з роботи, то побачив, що наша сусідка, знаходячись в стані шоку, плаче й каже: “Слава Ісусу за те, що не стало світла, інакше наш будинок згорів би, і я б напевно загинула з усією моєю сім’єю!” Сталося, що сміттєвоз зачепив стовп, через що високовольтні кабелі впали прямо на її будинок. Якби в цих кабелях була напруга, напевно сталася б трагедія. За важких обставин не легко буває сказати: “Дякуємо, Господи”. Але маємо завжди дякувати Богу, тому що будь-яка проблемна ситуація – то можливість вчитися довіряти Йому, навіть якщо ми не розуміємо Його цілей. Отче, ми шануємо Тебе своїми словами, але дуже часто наші дії викривають нашу недовіру Тобі. Допоможи бачити Твою працю у будь-якій ситуації – якою б важкою вона не була. Божою ласкою ми можемо бути вдячними Богу за все. В нашем городе регулярно отключают электричество. Это случается до трех раз в неделю. Порой света нет по двадцать четыре часа, отчего все погружается в непроглядную тьму. Бывает непросто, учитывая, насколько мы зависим от электричества. Наша соседка-христианка часто спрашивает: «За это тоже нужно благодарить Бога?» Она ссылается на слова Павла: «За все благодарите, ибо такова о вас воля Божья во Христе Иисусе» (1 Фес. 5:18). Мы всегда говорим: «Конечно, нужно благодарить за все». К сожалению, этим словам нередко противоречит наше ворчание, когда свет в очередной раз гаснет. Тем не менее однажды наше убеждение в том, что нужно благодарить Бога в любых обстоятельствах, приобрело новый смысл. Я вернулся с работы и обнаружил соседку в крайне взволнованном состоянии. Со слезами она воскликнула: «Слава Богу, что света не было! Сгорел бы и дом, и мы вместе с ним!» Оказалось, мусоровоз врезался в электрическую опору рядом с ее домом, и провода упали прямо на крыши нескольких домов. Если бы они были под напряжением, последствия могли быть жуткими. Трудные обстоятельства могут лишить нас чувства благодарности. Но будем помнить, что Бог в любом положении дает нам возможность довериться Ему, и неважно, понимаем мы что к чему или нет. Отче, мы чтим Тебя словами уст, но часто наши поступки свидетельствуют о маловерии. Помоги нам видеть Тебя в любых обстоятельствах, какими бы трудными они ни были. С Божьей помощью мы можем благодарить за все.